Wandell School is where I spent my kindergarten through 8th grade and it would be fair to say that 70% of the student body went through all 9 years together. It was the golden years of puberty: training bras, awkward growth spurts, and first visits by Aunt Flow. We were a tiny school with just over 30 students in each grade. After a full decade of very close quarters and embarrassing coming of age moments shared, I was desperate for change. We needed a bigger pond, more people to get lost in, and most importantly, fewer kids who knew everything there was to know about you. Saddle River, N.J. remains an affluent, very upper class community to this day. Our student body in 1986 mirrored this by wearing almost strictly junior country club attire. There were a few exceptions to this rule (thanks to pop culture trends based around Madonna and Michael Jackson) but the general Wandell population was preppy and expensively dressed. To stray from this uniform was the next best thing to wearing a KICK ME sign. Our grade was too small in size to be divided into the kind of social groups you see stereotyped in the movies and television. There were two: the extroverts and the introverts. With so few of us, it was difficult to be truly divided. By the nature of our wealthy community and just two classrooms per grade (11-15 kids per classroom), we were a ridiculously exclusive group already. My 8th grade year was one of many transitions. I was class president. 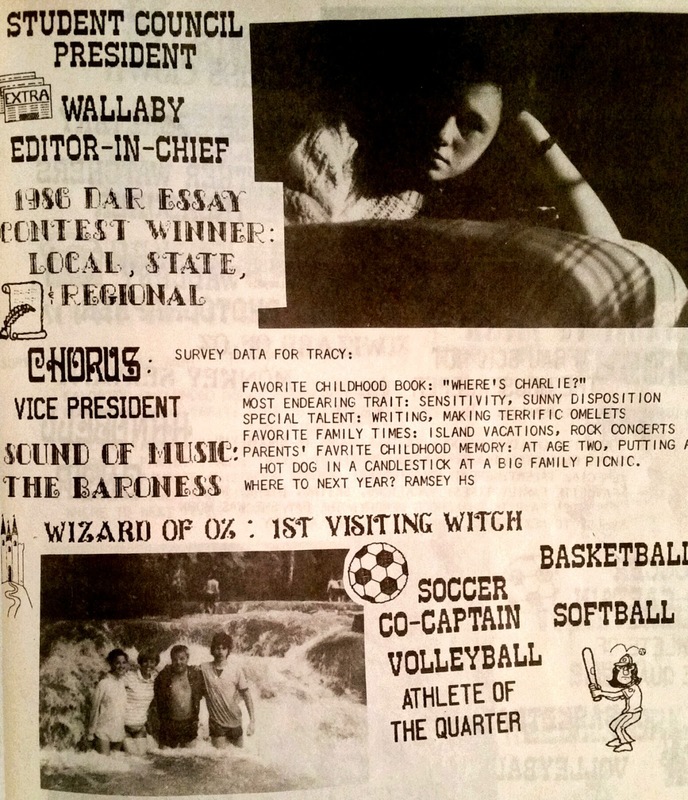 I was the editor of the school paper. I played on nearly every girl’s sport team. I was a slender jock with a growing passion for books and music. I wore dock siders. My favorite clothing came from Banana Republic. I summered at various friends parent’s beach houses up and down the east coast but an internal revolution was taking place. The more detached and alone I felt (see chapter 4), the more deeply I explored underground sub culture. I was hungry to shed the uniform of my fellow classmates. The problem was that there was no easy way to evolve into this person I wanted to be; the student who wanted to wear thrift store dresses with combat boots and give the finger to anything to do with activities on a court or field. I was really a brooding writer who worshiped Anne Sexton’s poetry and was tired of delivering mundane school news in article form. I was fast becoming the record collector who wanted to learn the secret language of the Cocteau Twins records and was trying forget that I once had two hermit crabs names Asia and Toto. 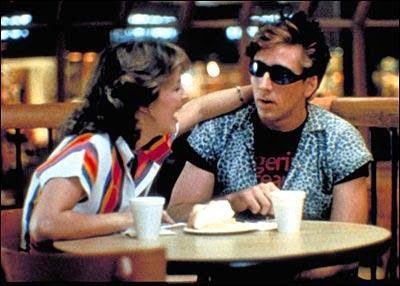 I was the girl who wanted to date my own offbeat Randy from Valley Girl and not any of the shallow "Val" dudes. There was an entire grade of peers who knew me as well as my own family did and like all school kids, they were capable of the harshest of criticisms. They could sniff out change like hound dogs so as we all muddled our way through the clumsy early teen years in sheep’s clothing together. I think many of us future freaks were holding out for high school to butterfly into the new fangled 2.0 version of ourselves. During this time frame I fell in love for the first time. Matthew was very tall, handsome, and sensitive. His mother was a retired model. He rode horses, bathed in Polo cologne, and had dazzling dimples however if you distilled him down to his true essence, he would be the kind of John Hughes character you would love to hate. Regardless of his wavering interest in me , I ached for him to the point of obsession for several years. His musical taste was exotic compared to my classmates as he almost exclusively listened to Peter Gabriel, Nik Kershaw, and Marillion. I didn’t know what to call Matthew’s choice of favorite bands at the time but he was the first of many Anglophiles I would meet throughout my life. It never occurred to me at the time that there were people in the world who preferred music from other countries so in the '80s this just added to Matt’s dreamy status. Peter Gabriel’s So came out in 1986 and it was the perfect palatable mix of quirky meets mainstream for my green ears. “Sledgehammer” had wormed its way into the ears of hit radio listeners but Kate Bush’s duet “Don’t Give Up” and the epic power ballad “Red Rain” made our young hearts swell. “Mercy Street” was an ode to Anne Sexton (SQEEEE!!!) and single-handedly changed my understanding what lyrical content could be inspired by and reflect. Three years later the film Say Anything blasted “In Your Eyes” through a boombox held high over Lloyd Dobler’s head but we understood this to be the ultimate tribute to love and romance three years earlier. Nik Kershaw was a blip on the 1985 Live Aid roster to most Americans however “Wouldn’t It Be Good” garnered a small bit of attention in the mid ‘80s thanks to MTV. In 1986 a cover version appeared in the much beloved soundtrack to Pretty in Pink but he remained relatively unknown and overshadowed by similar artists like Howard Jones. Nik’s gloomy synth Pop felt like a secret, exclusive club that we were proud to be members of. Marillion was a hand me down favorite band of one of his older brothers. Musically they perfectly connected a sound that fell somewhere between Genesis and Peter Gabriel but at age 15 they were too theatrical ‘70s prog rock to hold my attention. To come clean, as enamoured with Matt as I was, I still fast forwarded through the Marillion songs on his mix tapes. Matthew’s taste in music gave him the aura of sophistication however this was only thing about him that set him apart from the average teenage boy with a wandering eye and a disinterest in a serious girlfriend. We went out and broke up several times between 1984 and 1986 but his final attempt to win me back came in the form of a picnic on his family’s horse farm. It was eerily similar to Andie and Blane’s second date of Pretty in Pink and it just so happens that PIP debuted in February of that year. In the summer of 1986 eighth grade was finally behind me. I was free of the past decade of grade school baggage and Matt was among the first things I wanted to shed. I was still in the baby stages of defining this new me but I was just different enough to instantly sound the alarms to the cocky boy picking me up fresh from prep school looking for a pet poodle to follow him around. The date itself was ridiculous. He had packed a bottle of wine and I didn’t drink. I didn’t and still don’t know the first thing about riding a horse. It was an afternoon all about him, his interests, and while it was romantic in theory, I was uncomfortable and bored. The more he talked about himself, the more despondent I became. He didn’t like the music I said I was listening to. He made fun of my over sized art school clothes and grandpa looking shoes. He questioned my favorite books. I struggled to stay upright on a beast that terrified me from the first trot. I was in search of a world outside of the confines of my elitist grade school circle and a future polo matches followed by ivy league school dances turned my stomach. It would have been an easy path to follow as I was literally already in the saddle but I asked for an exit from it that very day. We drove home in near silence. As we pulled into my parents driveway he finally spoke. “I don’t know who you anymore.” I wasn’t sure who I was yet but I was thrilled at the progress made that day. I agreed, smiled, and was gone for good.